One of the most basic concepts in handling sheep and other livestock is the flight zone. All animals have a flight zone. A flight zone is an animal’s personal space. It is where the animal feels comfortable and unthreatened. When a person is outside the animal’s flight zone, the animal will turn and face the handler. It is best to work on the outside of an animal’s flight zone. If the flight zone is penetrated too deeply, animal behavior can be unpredictable and dangerous. Sheep are not large, but they are quick on their feet and strong for their size. Pile-ups can result in small enclosures, causing injury to the animals, especially the small or weak ones.The size of an animal’s flight zone varies. It depends how wild or tame the animal is. 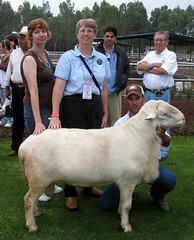 Sheep that have not had much human contact will have a large flight zone, whereas pet sheep may not have a flight zone. Sheep confined to a small space will have a smaller flight zone than sheep confined to a large area. Frequent, gentle handling tends to diminish the size of the flight zone. 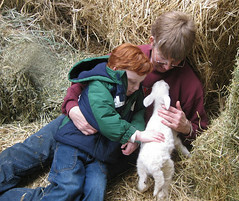 At the same time, sheep have excellent memories and can remember rough handling. Point of balance is another important livestock handling concept. The point of balance is at the animal’s shoulder. All species of livestock will move forward if the handler steps behind the point of balance. They will back up if the handler stands in front of the point of balance. Many people make the mistake of standing in front of the point of balance while trying to get livestock to move forward through a chute. Sheep will usually refuse to move if they see people up ahead. Very often, you need to move sheep, to bring them in from a pasture or to move them to another pasture. If you don’t have a herding dog to fetch the sheep, you can train the sheep to come to a vocal command or rattle of the feed bucket. Most sheep will come when they think they are going to get grain to eat. If these don’t work, it will be necessary to go out to the field to get the flock and either drive them from behind or lead them with a feed bucket or lead sheep. Pet sheep are difficult to drive and make good lead sheep. If the sheep aren’t familiar with where you want to move them, you may need several people to act as herders. Always move sheep slowly, calmly, and quietly. Do not allow splinter groups to develop. To move individual sheep, hold the sheep under its jaw and push its dock (“go-button”). Small numbers of sheep can be halter-broken for ease of moving and handling. Attempting to lead a sheep that is not halter-broken is usually a futile exercise.